Damascus, SANA-A medical team at Damascus Hospital managed to successfully remove an extensive tumor from a woman in her forties in a delicate 9-hour surgery. 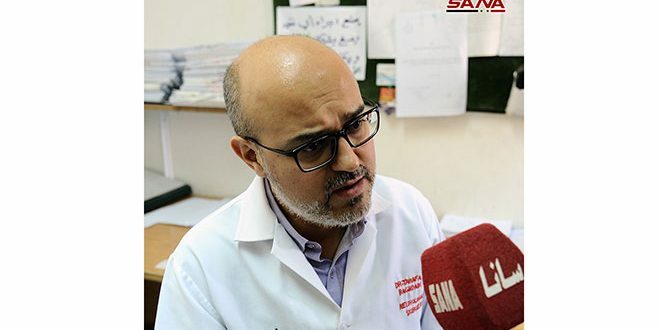 Head of the team, neurosurgeon Dr. Tarfa Baghdadi, explained to SANA that the woman was suffering from a large tumor behind the ear and in the upper part of the neck, which presented the team with a challenge given the surgical intervention’s proximity to the artery feeding half of the brain. Any misstep would have led to dire consequences, he said. The patient, Kawthar Nassr, 47, was subjected to 33 radiology and imaging sessions of the arterial vessels that fed the tumor, Baghdadi added, indicating that a decision to remove the tumor by surgical intervention was finally reached. The patient is in top form following the surgery, he said, adding that she will be undergoing a second surgery after one month. “Initial counselling had advised against going under the knife for its dangerous consequences, but I visited the hospital and the surgeon took the decision to perform the surgery,” Kawthar said in a statement. “I am in a much better shape now and the previous symptoms have vanished. I am now preparing for my second surgery,” she added.